Pablo St. 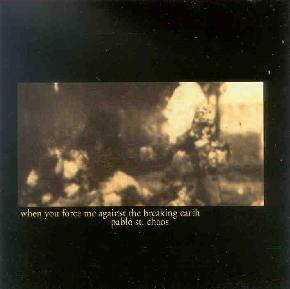 Chaos - "When You Force Me Against The Breaking Path"
A solo cd from Texas performs dark pieces that straddle the fence between rock structure and ambient guitar drone to very good effect. It sounds like it was all done with guitar and vocals, and the slowly progressing pieces do recall Labradford (who are namechecked in the press sheet) but some of the tracks at the beginning, such as "Over-exposed", really remind me of the drone/ambient end of the early UK group Flying Saucer Attack. The noisy yet melodic layers of strummed and droning guitars with whispered/buried vocals just really bring them to mind. It is different hovever, in that there is less focus on conventional melodic structure (especially in the vocals, which carry the melody of a lot of FSA stuff) and is certainly much darker and clanging. After the first few tracks the vocals are done, and the focus moves more towards thick reverb and delay saturated drone pieces such as "Peter's Colony At Delaford" and "Soft as the Underbelly". Another reason to keep Texas in the Union, along with the Charalambides and a few other of other really fine underground artists! For more information you can visit the Pablo St. Chaos web site at: http://www.st-chaos.net.